"Samurai Jack is the titular character and main protagonist of the cartoon Samurai Jack. He is voiced by Phil LaMarr." Samurai Jack will always be in most of our childhood memories as the defining example of badass. From beating up a near-omnipotent demon Aku, from effortlessly slicing up ugly aliens, we all know him from his epic nature, and of course, his legendary sword crafted by the gods themselves. "This sword was forged from the righteousness of the qi within thee. It possesses the power to destroy this evil force." Because Odin, Ra, and Vishnu crafted this weapon, it is designed to be able to vanquish (kill) anything evil with ease, as well as be able to cut through any material (given there is enough force behind the sword itself). It cannot be wielded by anyone that is evil, and won't hurt anyone innocent, or pure. Samurai Lord (Jack's father) with the sword for the first time. Samurai Jack's first time with the legendary sword. Our hero Jack has went through training ever since he was a small child. From training archery with Robin Hood, wrestling with Romans, mastering martial arts with Shaolin Monks, to learning foreign languages, Jack is the pinnacle of human perfection. Jack training under numerous masters of their own respective field. So yeah, Samurai Jack is not a person to mess with. Easily defeats numerous Aku Minions, as well as catching a whip mid-attack with ease. 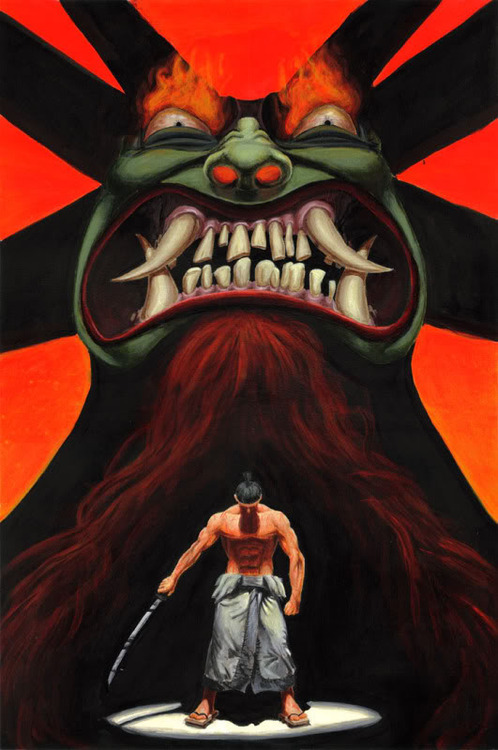 Jack fights Aku for the first time, and defeats him. Unfortunately, Aku is really cheap and sends our samurai into the future. After Samurai Jack's re-entry from time portal, he is immediately attacked. Samurai Jack easily dispatches alien thugs (some with missile launchers for arms). With a little bit of planning, Jack fights an entire army of Aku's Beetle Drones and wins. Absolutely destroys a group of alien gladiators. Despite having days of preparation, a group of the most dangerous, infamous bounty hunters from around the galaxy are killed swiftly by an ambushed Samurai Jack in under a couple seconds. After a prolonged fight with a Shinobi Shadow Warrior, literally using lightness and darkness, Jack comes on top as the victor. Jack facing off against Mondo-Bot, a robot that nuked an entire city and is taller than the tallest skyscraper. Samurai Jack defeating 3 Archers who had previously defeated Aku's huge army. They wielded magic arrows that almost never missed their target. Samurai Jack surprising a nigh-omnipotent being with his jumping ability. Overcomes a multi-ton grip from a giant summoned by Demongo, and stabs the giant on his hand. He later uses the rock to smash it against the giant's head (not shown in clip). Jack instantly reacts to robot mobsters with future Tommy Guns. He also easily deflects their bullets (not shown in clip). Samurai Jack defeating a popular, deadly gladiator without his sword. Holds his own against The Guardian, a warrior who has lived for eons protecting the time portal. Got more feats or tads of information you know? Post them or PM me and I might add it to the thread. Samurai Jack is a badass. Yes, Jack is a badass mofuga. And his cartoon is possibly one of the best ever made no hyperbole. Nice job collecting this, YNCG. And where the frak is my live-action Samurai Jack movie?!?! Yes he is a badass. Samurai Jack should never be live action a lot of what made the show so good could not be done live-action. Entire episodes were based around clever animation and playing with drawing styles. But I kept hearing they were supposed to close the series with a live-action movie. I would take any thing that would provide closure at this point. The creator of the show says that he is still working on making an animated film to wrap things up. It's going to take time though, but he is trying. Wicked job YNCG! I'll definitely come back to this if I ever need references! He's badass all the time, yet he's so badass it isn't redundant. @samimista: It is kind of creepy as well if you think about it. @frogdog: DUDE! I can look up in your nose! Maybe if you clean your nose more often you wouldn't get the cold. I remember that. I'll try and find a clip of it. Thanks! There will always be voice actors who are similar to others...at least I hope so. Updated with more feats (including the #1 IDW issue). It's too small to stomp Jack. One of my all-time favorites, right alongside Avatar: The Last Airbender. Enjoyed the first issue of the comic series from IDW. Hope we'll get a few animated films soon. @yourneighborhoodcomicgeek This is awesome mate! I really liked Samurai Jack a few years ago... Now im inexplicably intrigued by his comic, was it made from a Indy company? @yourneighborhoodcomicgeek: Since when is Aku nigh omnipotent? @the_almighty: Well, he can be considered that if the only thing that can defeat him is only one weapon. Right now, I am asking myself if any Superhero of DC or Marvel (not ascended entities) could defeat him if only that sword can hurt him. When's the new season starting? Actually his jumping ability was the product of hard training, and thus could be reduced in effectiveness if said training was slacked off. So it may not count as an actual ability.